Probing and irrigation is a procedure used to assess the anatomy and functional status of the lacrimal drainage system. When done correctly, it is a well-tolerated and safe procedure that provides extremely useful diagnostic information, as well as assists surgical planning when pathology is encountered. In cases of trauma, this procedure can help assess the integrity of the system and look for the presence of canalicular injury (see Laceration, Canalicular). It is also very useful in cases of epiphora, which is defined as overflow tearing  due either to primary or secondary overproduction of tears or to inadequacy of the lacrimal drainage system. In addition, the procedure is very efficacious for treating congenital nasolacrimal duct obstruction. 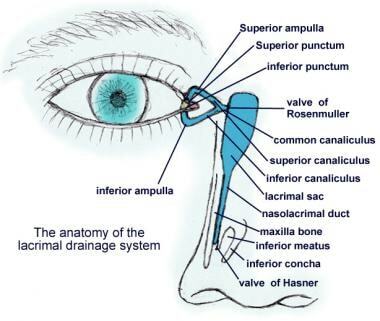 The lacrimal drainage system (see Nasolacrimal System Anatomy) begins at the puncta, which are located medially on the margins of the upper and lower eyelids. Each punctum leads to its own canaliculus. These canaliculi pass approximately 2 mm vertically, then turn 90º and run 8-10 mm medially to join the lacrimal sac (see the image below). 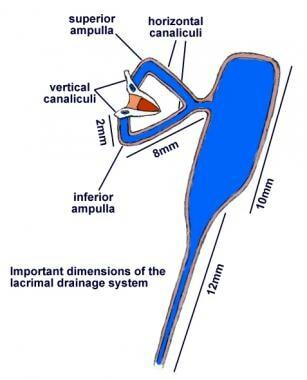 Dimensions of lacrimal drainage system. In 90-98% of patients, the canaliculi join to form a common canaliculus that enters the lacrimal sac. [2, 3] At this point, some patients have a fold of tissue that is thought to create a functional 1-way valve preventing reflux into the canaliculi. This membrane is referred to as the valve of Rosenmüller (see the image below). The lacrimal sac lies in a bony fossa in the anterior medial orbit and extends inferiorly to form the nasolacrimal duct. This duct measures 12 in length mm and has a distal valve, the valve of Hasner, before it opens into the nose through an ostium at the inferior meatus. This ostium is patent in only approximately 50% of infants at birth. If it is not patent at birth, it usually becomes patent during the first few months of life. Delayed or incomplete patency is the cause of congenital nasolacrimal duct obstruction. Also of importance in the infant population is that the distance from the punctum to the level of the inferior meatus is approximately 20 mm. Probing and irrigation of the lacrimal drainage system should be performed whenever analysis of the lacrimal drainage system is indicated. In the case of nasolacrimal obstruction–related epiphora, this procedure provides vital insight into the location and severity of obstruction if present. The results not only help identify the cause of a patient’s epiphora but also assist in surgical planning if the results are abnormal. In the case of trauma to the eyelid or medial face, probing and irrigation can help determine if there is injury to the lacrimal drainage system. In the setting of acute trauma, a visible lacrimal probe inserted in the canaliculus or leakage of irrigation fluid through a traumatized eyelid is an indication of canalicular injury that must be addressed during planned repair of the trauma. In the case of congenital nasolacrimal duct obstruction that does not resolve by the age of 12 months,  probing of the canaliculi and the nasolacrimal duct is performed with the patient under anesthesia to achieve patency in the system. The main contraindications are acute dacryocystitis and acute canaliculitis. In the case of obstruction due to acute dacryocystitis, palpation of a distended lacrimal sac produces reflux of mucopurulent material from the canalicular system. This reflux confirms complete nasolacrimal duct obstruction, and no further diagnostic testing is indicated. In the setting of active infection, probing and irrigation is more likely to cause trauma because the lacrimal sac wall is inflamed and friable; it also can cause unnecessary pain and anxiety for the patient. The concerns in canaliculitis are similar to those in dacryocystitis. Active infection can make passage of a probe or cannula difficult, and iatrogenic trauma is more likely to occur in these cases. A particular concern in canaliculitis is the frequent presence of stones within the canaliculus. Probing and irrigation can force these stones deeper into the canaliculus, making subsequent removal more difficult. If pathology of the lacrimal drainage system is suspected, probing and irrigation of the system is a useful diagnostic tool. In the case of congenital nasolacrimal duct obstruction unresponsive to Crigler massage, probing through the membrane of Hasner is often curative. After instillation of topical anesthesia (see Periprocedural Care), the lower punctum is dilated with a punctal dilator (see the image below). The punctal dilator is introduced vertically into the punctum and then rotated. 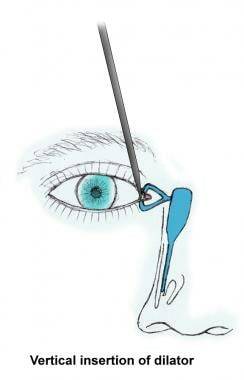 To prevent canalicular kinking and to stabilize the eyelid for passage of the lacrimal probe, lateral traction is applied to the lower lid (see the images below). Lateral traction on lower lid straightens and supports canaliculus to allow passage of lacrimal probe horizontally. A small (00) probe should be used initially, followed by progressively larger probes if possible. 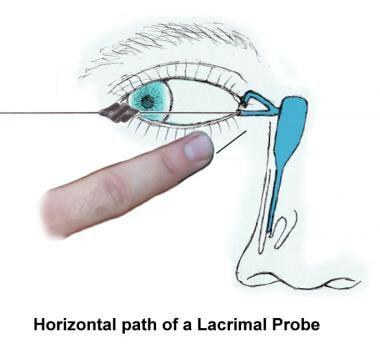 If a “hard stop” is felt during probing of the canaliculi, this implies that the probe has come up against the lacrimal bone, which suggests that the lacrimal drainage system is patent up to the lacrimal sac (see the image below). 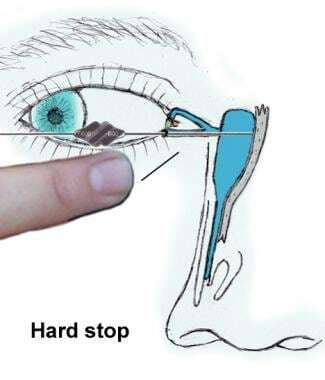 "Hard stop" occurs when probe is passed through lacrimal sac until it contacts bone. Occasionally, a "soft stop" is felt; this implies that the probe's distal progress is impeded by soft tissue, suggesting either stenosis or obstruction of the canalicular system. Frequently, however, this "soft stop" does not reflect true canalicular obstruction but results from kinking of the canaliculus created by bunching of the soft tissues in front of the probe tip (see the image below). Such kinking can usually be eliminated by withdrawing the probe, increasing the lateral traction on the lid, and probing again; this should enable the probe to pass into the sac. "Soft stop" occurs when distal progress of probe is impeded by soft tissue, suggesting stenosis or obstruction of canalicular system. However, iatrogenic kinking of canalicular system can also result in "soft stop." If the medial angle of the palpebral aperture shifts medially as the cannula is advanced toward the lacrimal bone, this also implies canalicular pathology. If stenosis or obstruction is encountered, the probe is clamped at the punctum while it is inserted to the level of stenosis or obstruction. The probe is then removed, and the distance from the end of the probe to the clamp is measured; this is the distance to the site of stenosis or obstruction. Therapeutic probing is done in cases of congenital nasolacrimal duct obstruction (see the video below). A topical vasoconstrictor, usually oxymetazoline hydrochloride, should be used intranasally to limit bleeding as the probe enters the nose. Probing is then carried out as described above. Nasolacrimal duct probing for congenital nasolacrimal duct obstruction. 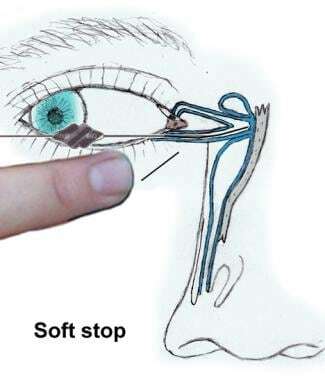 After the probe enters the lacrimal sac (as signaled by the presence of a "hard stop"), it is rotated superiorly, with the body of the probe against the brow. Once the probe is rotated to the level of the supraorbital notch at the superior orbital rim, it is guided down the nasolacrimal duct, directed slightly posteriorly and laterally as it is advanced. Any significant resistance at this point should not be overcome with force; instead, the probe should be withdrawn and the procedure repeated. Once the probe is believed to have passed to the level of the inferior meatus, its position can be confirmed in several ways. Direct visual confirmation is the most reliable method and can be achieved by using a nasal speculum and fiberoptic headlight or by using a nasal endoscope. Tactile confirmation can be achieved by employing a second metal instrument placed into the nose under the inferior turbinate. Manipulation of the instrument in this space will contact the probe if the probe has entered the nose. This contact can be felt by the opposite hand, which is holding the probe in place. This technique is also useful for clinicians who choose to infracture the inferior turbinate to remove any contact the turbinate could have with the ostium. Finally, irrigation with a saline/fluorescein mix can be performed after probing; if the fluorescein can be retrieved from the inferior meatus by suction after irrigation, patency is confirmed. To perform irrigation of the lacrimal drainage system, topical anesthesia is administered as described above. The lower eyelid punctum is dilated with a punctal dilator. A lacrimal irrigation cannula attached to a 1 mL or 3 mL syringe filled with normal saline is used. A Luer lock syringe should be used to prevent inadvertent projectile injury. 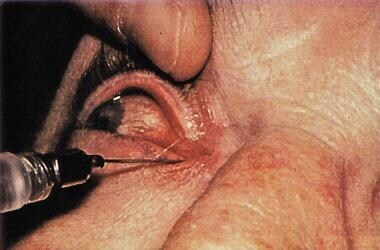 The patency of the nasolacrimal cannula should be tested prior to use. Patients should be reassured that the nasolacrimal cannula is not a needle. Lateral traction is applied to the lid to prevent canalicular kinking. Once the tip of the cannula is at the level of the horizontal canaliculus, the saline is injected slowly, and the results are noted. A patient with a normally functioning lacrimal drainage system will feel and taste the fluid passing into the nasopharynx as it is injected. If the cannula cannot be advanced, if the irrigation fluid cannot be injected, or if the fluid refluxes back through the punctum around the cannula, total canalicular obstruction is likely to be present. If the saline can be injected but refluxes through the opposite canalicular system, blockage of the common canaliculus or nasolacrimal duct obstruction is likely to be present (see the image below). Upon irrigation of lower canaliculus, reflux through opposite canalicular system implies blockage of common canaliculus or nasolacrimal duct obstruction. The 2 entities can be differentiated by probing. If irrigation is successful and no reflux exists, but the sac becomes distended with no saline passage into the nose, this demonstrates nasolacrimal duct obstruction with a competent valve of Rosenmüller that prevents reflux back into the canalicular system. In certain cases, some degree of reflux through the opposite canalicular system is observed, but the patient still feels and tastes normal saline flowing into the nasopharynx. This implies that the patient may have a partial nasolacrimal duct obstruction. Despite the passage of fluid under the positive pressure of the irrigation cannula, partial nasolacrimal duct obstruction can create enough resistance to inhibit tear drainage under physiologic pressures. The lacrimal drainage system is susceptible to injury during probing and irrigation. Incorrect technique or failure to recognize resistance to further advancement of the probe within the system can lead to trauma of the canaliculi or nasolacrimal duct. This trauma can lead to the creation of a false passage or cicatrization and stricture in the area of the injury. With time, subsequent canalicular or nasolacrimal duct obstruction can occur. 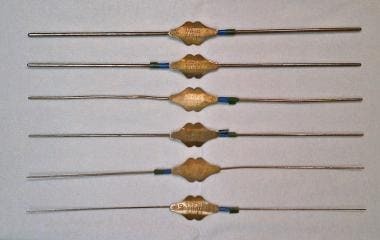 The equipment required for probing and irrigation of the lacrimal drainage system includes lacrimal probes (see the first image below), a punctal dilator (see the second image below), and a lacrimal irrigating cannula (see the third image below). Bowman probes in progressively larger sizes. With the use of topical anesthesia, canalicular probing and lacrimal system irrigation is usually well tolerated by adult patients. A drop of topical anesthetic (eg, proparacaine or tetracaine) is applied; some clinicians also soak a cotton-tipped applicator in the topical anesthetic and hold it on the puncta for several minutes before the procedure. In the case of congenital nasolacrimal duct obstruction, topical anesthesia, conscious sedation, or general anesthesia can be used, depending on the age, mental status, and medical comorbidities of the patient. Therapeutic probing is commonly done with general anesthesia around age 12 months. The nose should be inspected. Headlight visualization and suction are helpful adjuncts. Orbit, Eyelids, and Lacrimal System: Basic and Clinical Science Course. San Francisco: AAO; 2008. Section 7: 265-278. Yazici B, Yazici Z. Frequency of the common canaliculus: a radiological study. Arch Ophthalmol. 2000 Oct. 118(10):1381-5. [Medline]. 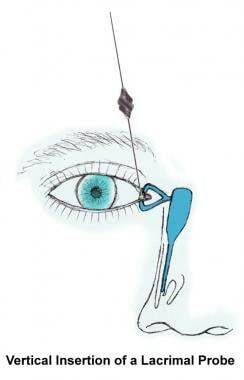 Jones LT. An anatomical approach to problems of the eyelids and lacrimal apparatus. Arch Ophthalmol. 1961 Jul. 66:111-24. [Medline]. MacEwen CJ, Young JD, Barras CW, Ram B, White PS. Value of nasal endoscopy and probing in the diagnosis and management of children with congenital epiphora. Br J Ophthalmol. 2001 Mar. 85(3):314-8. [Medline]. [Full Text]. Thongthong K, Singha P, Liabsuetrakul T. Success of probing for congenital nasolacrimal duct obstruction in children under 10 years of age. J Med Assoc Thai. 2009 Dec. 92(12):1646-50. [Medline]. Gigantelli JW. The lacrimal drainage system. Ophthalmology. 3rd ed. Philadelphia: Mosby, Elsevier; 2008. Weitzel EK, Wormald PJ. Endoscopic dacryocystorhinostomy. Cummings Otolaryngology: Head & Neck Surgery. 5th ed. Philadelphia: Mosby Elsevier; 2010. Disclosure: Serve(d) as a director, officer, partner, employee, advisor, consultant or trustee for: Allergan<br/>Received income in an amount equal to or greater than $250 from: Allergan.